Most of us will have to move at least a few times throughout our lives. Moving is an exciting time, but can also be stressful. Things like packing, changing addresses, and more can all make a big move feel like a big chore. While it might take some time and effort, usually moving can be an overall positive experience. A move can also be stressful on a pet. As a result, it’s a good idea to prepare your pet for the move as best as possible. This post will cover tips to prepare your pet for a big move. Some will be to help your pet, some will be to help you, and others will be reminders to follow along the way. Firstly, it’s important to stay calm during the moving process. If you find yourself stressing out about something, try and take a break from moving for a few minutes. Taking a walk, watching a TV show, or having a cup of coffee can help you calm down and get back on track. Studies have shown that dogs imitate human emotions and personalities, so if you are aggravated or stressed out while preparing for the move, there’s a good chance your dog will be as well. This goes for the entire process of planning, packing, and actually moving. So unless you want to deal with an anxious pet at the same time as your other issues, it’s a wise idea to remain calm throughout the process. If you don’t currently have a tag on your pet’s collar, you should seriously consider buying one. If someone finds an animal without a collar, they may take it to an animal shelter. Losing a pet is preventable, but all too common, so be sure to take every precaution to protect them, especially during a move. No matter how much your pet may love you, your family and your home, sometimes pets get lost. Animals are notoriously curious and it’s quite common for a cat or dog to get away, especially during a move. As a result, it is important to update your pet’s tags with your new address. If not, people may try and return your pet to your old address. You should also look to have one last visit with your vet before the move. Your vet should be able to provide you with the necessary medical records and documents you’ll need, refill any pet meds, and ensure your pet is healthy. Many states require that animals have a certificate of veterinary inspection, so be sure to get one of those if you are moving to a new state. If not, there is no guarantee that your pet will be able to be transported in. If you’re moving far away, there’s a good chance you’ll need to find a new vet for your pet. This can be a difficult process as each city has dozens to choose from. When searching for a vet, you’ll want to be sure hire someone experienced, educated, and with many positive reviews online. Of course, it’s also a good idea to ask your current vet about recommendations in the area you’re moving to. In the least, they may have some relevant suggestions from which to start searching. When moving, it’s common to sell or throw away old items you don’t need anymore. Some people do it to downsize, while others do it because they want to replace them. While taking stock of what you have and getting rid of some stuff is a good idea, you should be careful about this when it comes to the items that your pet has or uses. While some of their toys, bed, blankets, and other things might be old, you should try your best not to get rid of them or replace them. 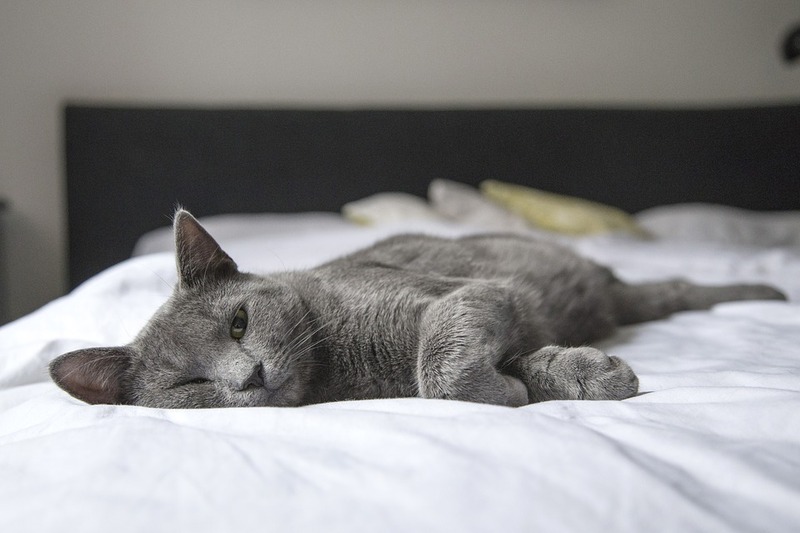 The familiar scent and feel of these items can make the move easier by making the pet more comfortable with its new home. It can also help keep them calm and relaxed ahead of the actual move. Scent is very important to dogs, so be sure to keep this in mind. The weeks bookending a move can be incredibly hectic. Things are being packed up, rooms are changing, and the entire home your pets are accustomed to will be different. This can confuse and stress them out, which could lead them to act out and behave differently. In an effort to combat this potential anxiety, it’s best to stick to the routine you have for your pets as much as possible, leaving some level of familiarity and structure. This will also help them to become comfortable more quickly in your new home. No matter where you move, you’ll likely be responsible for transporting your pet. If you’ve ever traveled with pets in the car, you know it can sometimes be a challenging experience. To help, it’s a good idea to prepare and bring along a “pet bag”. This bag should include things like food, extra water, treats, toys, blankets and a towel for cleaning up accidents. Anything you can think of that your pet may need during the trip. While this isn’t always the case, many pets require a crate or kennel when moving for long periods of time. If you’re using a new crate, make sure your pet is fully introduced before making the trip. Without this, driving with your pet can lead to extra anxiety for both you and the animal. In addition to keeping them calm, this will also keep them from potentially escaping during the move. If you choose to keep them at home in a separate room, be sure to make sure they are properly fed and hydrated. Moving can be loud. Instead of letting your pet roam, keep them in the quietest area you can find. On packing or moving days, it’s even a good idea to leave the pet with a friend or family member.